Christina Mavroudis and Jason Nuckels submitted this photo and caption. 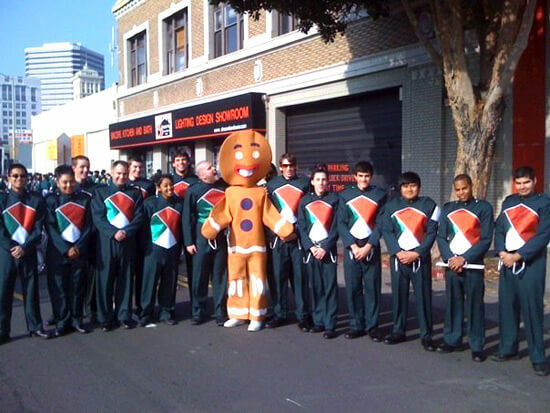 The newly formed Vanguard Cadets Winter Percussion Ensemble with Santa Clara Vanguard alumni performed in the Oakland Holiday Parade on Dec. 5, 2009. The parade drum line wore the SCV Cadets uniforms, trailed a Rudolph balloon the entire route, and enjoyed this photo 'bite' with a Gingerbread Man. Their next non-competitive performance is during the Emerald Bowl's pre-game show at San Francisco's AT&T Park on Saturday, Dec. 26. The Emerald Bowl (Boston College vs. USC) will be broadcast nationally on ESPN at 8 p.m. ET. The Vanguard Cadets Winter Percussion Ensemble begins competitions starting in February as part of the California Color Guard Circuit (CCGC), Central Valley Guard and Percussion Circuit (CVGPC), and Winter Guard International (WGI).